You are here: Interventional Radiology/Andrew Peterson, M.D. 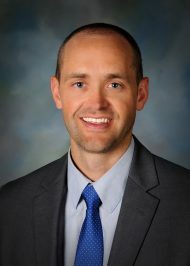 He received his undergraduate at Brigham Young University in Provo, and completed his medical degree at University of Illinois in Peoria. His internship, residency and fellowship were all spent at Banner University Medical Center at the University of Arizona in Tucson. He served on the Interdepartmental Tumor Boards, and as moderator and presenter for Monthly Interesting Case Conferences. Dr. Peterson has authored and co-authored multiple publications and scientific meeting presentations, including CT Dose Reduction for Lung Biopsy Techniques and an educational exhibit on Denver Peritoneovenous Shunts for Control of Malignant Ascites. Away from the office, he likes to spend time outdoors with his family, camping, hiking and fishing. He also enjoys fly fishing all of our Idaho rivers and lakes, playing basketball, volleyball and running.